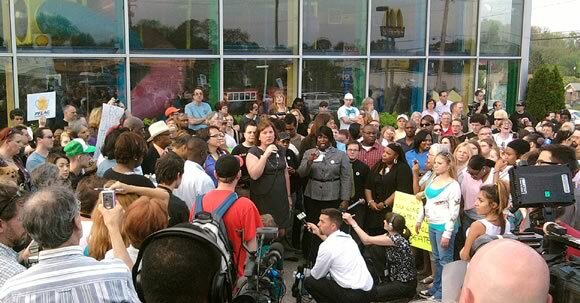 Hundreds of people rallied last week to protest the brutal beating of Chrissy Lee Polis, a transgender woman from Baltimore’s working-class eastern suburbs, at a local McDonald’s. Polis was attacked by two teenagers when she tried to use the restroom. The prolonged, merciless assault was photographed by a McDonald’s employee; several other employees stood around watching and did nothing to help. An older woman tried to intervene but was punched in the face, and the beating did not stop until Polis fell to the floor with an epileptic seizure, and the attackers were warned that police were on their way. As is all too often the case, the attack, which occurred Monday April 18, drew little media attention until the video was posted on the Internet and went viral five days later, with hundreds of thousands of views. Fortunately, Polis, although bruised and shaken, was not badly injured. Her attackers have been charged with assault. 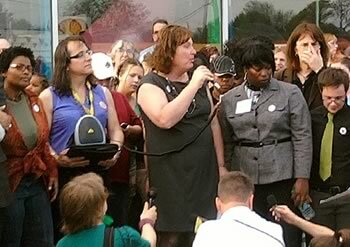 A week before the attack on Polis, a bill to extend anti-discrimination protection to transgender people in Maryland failed in the state legislature after months of effort by trans advocates and allies. The bill, HB 235, had passed the House of Delegates by a wide margin (86-52) but was sidetracked by the Senate President, Mike Miller, a Democrat, when it crossed over to the upper house. After intense grassroots pressure, the bill was finally moved to the appropriate committee, approved and sent to the floor on the last day of session, with commitments of support from 27 of the Senate’s 47 members. But Miller worked behind the scenes and turned around seven Senators who had promised to back HB 235, and it was killed 27 to 20 on a vote to recommit. Miller later said that he opposed HB 235 because it would be harmful to families, and, since no member of the legislature has hired a transgender staff person, he didn’t think legislators could require businesses to do what they wouldn’t do themselves. The anger this caused in the state’s LGBT community turned to rage after the Polis beating. We are reorganizing ourselves to bring the case for trans rights to the public and mount a successful effort next year. To view the video of the attack (warning: it is extremely violent and potentially upsetting), visit these pages at www.bilerico.com or www.lgbtqnation.com.